If you enjoy reading crime mystery book featuring Scotland Yard, you’ll love reading the Anne Cleeland books in order for her Doyle & Acton (aka New Scotland Yard) series. The series currently features seven books, with the latest, Murder in Misdirection, published early 2018. Here are the Anne Cleeland books in proper reading and publication order. The list updated with new books as they are released. Anne Cleeland was born in Pasadena, California, who is a lifelong Southern California resident. After earning a degree in English from the University of California, Los Angeles (UCLA), she went to the Pepperdine University, from where she earned her law degree. She is a member of the California State Bar. While in high school and college, Anne worked as a nurse’s aide in Labor & Delivery. She has always loved reading crime mysteries, especially those set in England, so it was natural that eventually when she would write books, those would be set in England as well. She worked as an attorney for many years before finally turning her interest to writing contemporary and historical mystery novels. Currently, the author is living on the island Balboa in California next to Newport Beach, where she is working on her next novel. She has four grown-up children, several grandchildren, and one dog. She is a member of International Thriller Writers, The Historical Novel Society, and Mystery Writers of America. The first Anne Cleeland book was Tainted Angel, released in 2013 as her debut novel. It is a historical mystery novel focusing on the Regency period in England during the Napoleonic wars around the early 1800s. It features Vidia Swanson who works as an “angel,” coaxing secrets from powerful men who are on a suspicion of being enemies of the Crown. However, the very first author ever wrote was The Bengal Bridegift, which was never sold, so Anne Cleeland serialized it on her website, a chapter per week. Once the book was fully added to her site, the author also self-published it on the Amazon platform. The latest standalone regency novel is The Barbary Mark, published in 2017, and features Nonie Rafferty, another agent to the Crown who is on an assignment in Algiers when things go wrong. It is interesting to note that Nonie is an ancestor of Doyle, one of the two main characters in the author’s contemporary Doyle and Actor crime mystery series. The Acton & Doyle series is narrated by Kathleen Doyle, a rather naive rookie detective who is working with Chief Inspector Michael Acton, a seasoned but reclusive, aloof and vigilante detective. Doyle is a redhead Irish who is the opposite of the wealthy lord that is DCI Acton. He is an enigmatic person who has a knack for solving cases, even if it means, at times, breaking the very low he is trying to uphold. Because, as a vigilante and occasional criminal, those things can easily happen. 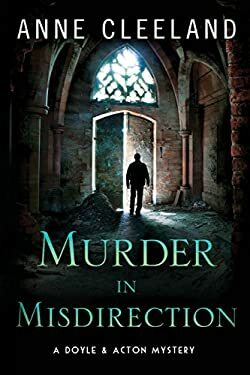 In Murder in Misdirection, Kathleen is on maternity, which gives Acton some peace of mind that his wife is out of harm’s way, at least for a little while. Doyle, who has some fey abilities, can see ghosts, so when she starts looking into a case on church grounds, things to really weird, and once again, she is in danger. Just what Acton wanted to avoid.